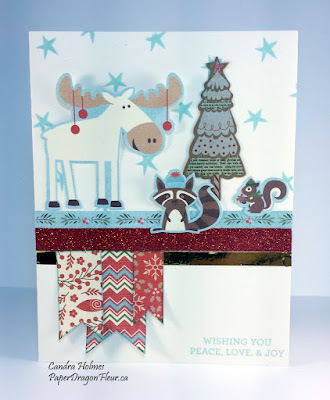 When I first saw the sticker sheets that come in the White Pines Complements I knew I had to do a card using the singing animals and the MOOSE! These cards actually went thru several variations until I found the right combo of elements. The problem was I wanted to show off the super cute animals but the background couldn't be too busy or they would get lost. 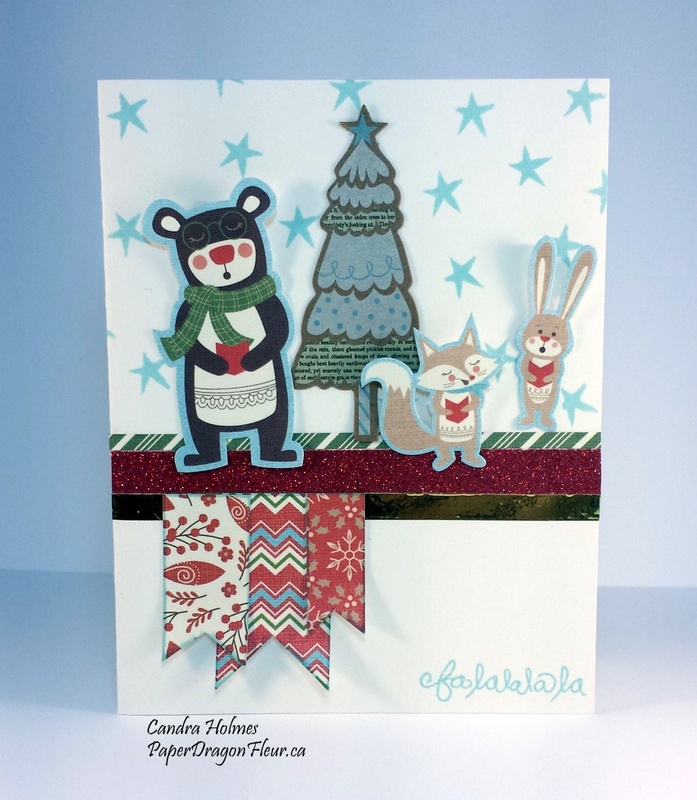 The solution turned out to be creating my own background and I used the cute little star from the Festive Trees (B1493) stamp set. This is a hostess rewards stamp and I also use it for my sentiments on both cards. I random stamped the stars, the sentiments and sponge distressed the banners using Glacier ink. Other products I used are White Pines Paper Packet for my little banners, Red Shimmer Trim, Gold Foil Tape and the green strip and blue holly and berries strip are from the compliment sticker sheets. About the compliments... I love them! When it was announced that they were changing the compliments I was excited because CTMH always gives us great product to work with. All the compliments packets now feature the 2 6x6 sticker sheets and a separate packet of goodies that typically contains printed Kraft die-cuts (like the trees on both these cards) and it also has either printed vellum die-cuts, chipboard or printed plastic die-cuts that all coordinate with the theme of the paper packet. For my Christmas Card workshops I am including a compliments packet with each kit and so far everyone has been very happy with them and they are going home with a ton of extra's to use on other projects.